This camouflage tarp is washable, reusable and recyclable for a long-lasting use. Tarp Width (ft.) x Tarp Length (ft.). Tarp fabric thickness: 5 mil. 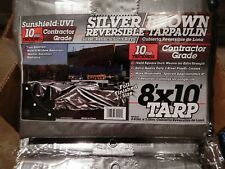 Tarp Size (ft). Strong poly fabric resists UV rays, water, tearing and mildew. I wanted to cover an outdoor exercise machine, but not what a shocking blue canvas...something that wouldn't stand out so much in my tree-filled yard. This one did the trick! Fast shipping, too! 6mil is not thick at all, this tarp is much thinner than what you would normally expect. Also, this wouldn't last long in the sun. Don't plan on using it to cover firewood all year long in your backyard. The tarp is A1 quality.